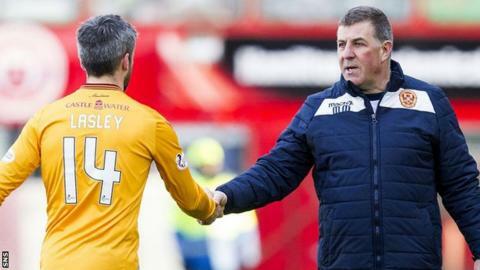 Motherwell manager Mark McGhee thinks his experienced out-of-contract players appreciate the club are doing their best to make them better offers. Stephen McManus, Keith Lasley and Steven Hammell have been told the club cannot afford to match present deals. Craig Samson and Scott McDonald are also in talks, with the latter having a year's option on his deal. "It's not really a take-it-or-leave-it as we are bending over backwards to find everything we can," said McGhee. Motherwell have lost £2m over the last four seasons and Les Hutchison signed an agreement in March to sell his majority shareholding to the Well Society fan-ownership group. McGhee believes players appreciate the reasons they have been offered reduced wages and hopes they will be persuaded to stay. "I think the boys are reasonable," he said. "The boys are intelligent and they understand the dilemma the club finds itself in. "They know we are not making it up. They know we are not saving a tranche of money to go and get someone else in. "They know we are doing the best we can to get them the best offers we can. "And, in their minds, they are trying to be as flexible as they can and as accommodating within their needs and expectations to help us as well. So I think there is a two-way thing going on." McGhee is also waiting on an answer from teenage defender Ben Hall's agent, while forward James McFadden is also out of contract. "We need a squad next year of 20 and in order to get that at a reasonable level we have to make offers to allow them to afford that, because we don't have a generous benefactor sitting in the wings to make up some shortfall," added the manager. "Those days have gone here. "We must work with what we have. The offers we have made and, if offers are improved, will be based on real money, on what we can afford without making the club go bust again."